The U.S. Marine Corps’ Expeditionary Energy Office has conducted an exercise at Camp Wilson that seeks to build on the military branch’s push for energy efficiency across the force. 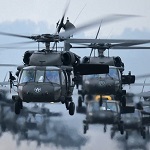 The Marine Corps said Friday the energy capability exercise aligns with the U.S. Navy‘s year-long Great Green Fleet initiative that aims to change the way the service uses energy to drive combat effectiveness. “[We] are demonstrating operational energy technologies that allow the Marine Air Ground Task Force to go further on the same amount of energy,” said Col. Brian Magnuson, director of the Marine Corps Expeditionary Energy Office. The Expeditionary Energy Office has tapped industry through technical field exercises to explore energy-efficient technologies for the future Marine Corps. Magnuson noted field artillery cannoneers with 3rd Battalion, 11th Marine Regiment, have begun to use a Ground Renewable Expeditionary Electronics Network System to support energy needs in the field. 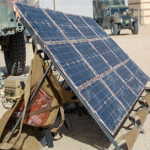 The hybrid energy power system uses solar panels and high-energy-density batteries to maintain operations in a deployed environment, the Marine Corps said.